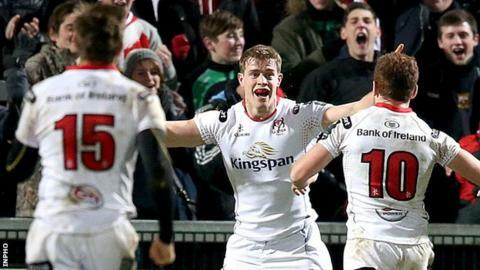 Ulster produced a remarkable five-try rout of Toulouse in the European Champions Cup at Kingspan Stadium. Nick Williams barged over in the 23rd minute before Andrew Trimble scored a sensational individual try to increase Ulster's lead to 17-0 at half-time. Man of the match Ruan Pienaar set up a Luke Marshall score after the break with a brilliant crosskick. Stuart McCloskey and Chris Henry also crossed as Toulouse failed to score in a European game for the first time. Ulster went into the game knowing a second home defeat in Pool One could have effectively ended their chances of making the knockout stages but this brilliant display and bonus-point win is a huge boost to their qualification hopes. The Irish province will meet the four-time European champions in the return fixture next Sunday in France. The home team's display was all the more commendable given the injuries in the squad with Iain Henderson, Peter Nelson, Dan Tuohy and Darren Cave joining Tommy Bowe and Jared Payne on the treatment table after last weekend's Pro12 win over Edinburgh. Ulster started with a brisk tempo and the pressure eventually yielded a try for Williams midway through the half as the decision to opt for a line-out, instead of going for the posts from the penalty, was rewarded as Pienaar's quick pass helped set up the New Zealander to score. With the influential Louis Picamoles already off because of a shoulder injury, Toulouse were looking ragged - not least a couple of poor penalty attempts from one-time England stand-off Toby Flood. After a Paddy Jackson penalty increased Ulster's lead, the home side struck a significant blow two minutes before the interval as Trimble gathered his own chip over the top to touch down after Pienaar had got his pass away despite being cynically tripped by Yacouba Camara. A last-ditch Vincent Clerc tackle prevented a Craig Gilroy try after the resumption but the third touchdown was not long in arriving as Pienaar displayed wonderful vision to find the unmarked Marshall with a gorgeous kick to the left corner. The Toulouse defence was marked absent as emerging centre McCloskey ran in the score that secured the bonus-point on 53 minutes before a vintage maul set up Henry's try as Toulouse wasted late chances to at least get on the scoreboard. Ulster director of rugby Les Kiss: "We just had a message to be relentless either side of their ball-carriers and make sure that we sucked the life out of their play. "We had a few more guys out after last week because of injury but the boys didn't allow that to hijack themselves and say: 'Poor me'. "A superb week of preparation set this up." Replacements: Rob Herring for Best 56, Andy Warwick for McCall 58, Ricky Lutton for Herbst 63, Clive Ross for van der Merwe 71, Roger Wilson for Williams 52, Paul Marshall for Pienaar 63, Ian Humphreys for Jackson 63, Rory Scholes for Trimble 78. Replacements: Julien Marchand for Flynn 49, Cyril Baille for Kakovin 49, Dorian Aldegheri for Johnston 49, Edwin Maka for Maestri 66, Gregory Lamboley for Picamoles 15, Jean-Marc Doussain for Bezy 54, Alexis Palisson for Fickou 63.